Recent progress in containing California’s deadliest ever wildfires could be short lived as weekend forecasts predict strong winds, which could potentially create dangerous fire conditions. The National Weather Service (NWS) issued a red flag warning for a large swath of the state up until Sunday morning. It advised that any new fires could spread rapidly due to gusty winds and very dry conditions. The NWS also added that the circumstances could hinder the work of firefighters battling current wildfires. Officials said Friday that firefighters had finally made progress in containing the fires. The California Department of Forestry and Fire Protection said in a statement that the Tubbs fire in Sonoma and Napa counties were 44 percent contained. In its latest update, the Sonoma County Sheriff's Office praised the resilience of the fire crews. "We're making a lot better progress today," Steve Crawford, the Cal Fire operations chief for the Tubbs fire told NPR. Authorities noted that danger has not fully abated yet, however, and voiced concerns over the latest weather forecasts. "We are concerned about red flag warnings. We've had various reports of winds that could exceed 40 miles an hour," CalFire Unified Incident Commander Brad Gouvea said. 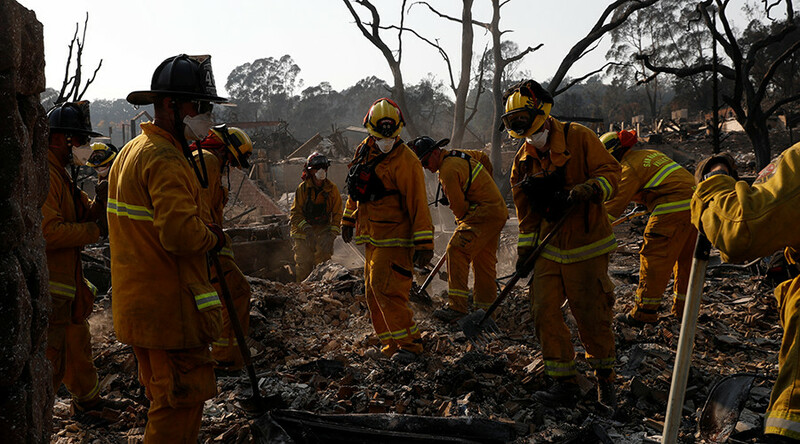 More than 30 people have been killed by the blaze, and parts of Santa Rosa city in Sonoma County have been reduced to cinder with at least five percent of the homes destroyed. The cost of the damage could reach $1.2 billion, according to Santa Rosa Mayor Chris Coursey, as reported by the LA Times. #BREAKING Santa Rosa officials say #TubbsFire wiped out 5% of the housing in the city. Damage is at least $1.2 billion dollars, so far. Eerie drone footage of a postman delivering mail to still-intact mail boxes outside scorched homes in Santa Rosa reveals the devastating impact of the firestorm. The mail van is seen driving through what looks like a post-apocalyptic world and dropping off mail. At one point, a stark contrast is laid bare between the fire-ravaged houses one one side of the street, while apparently untouched houses stand opposite. The aerial footage was captured by photographer Douglas Thron. “It was a trippy thing — he was actually delivering the mail,” Thron told Mercury News.